So, last weekend I attended my first ever blogging event and it was a good one! 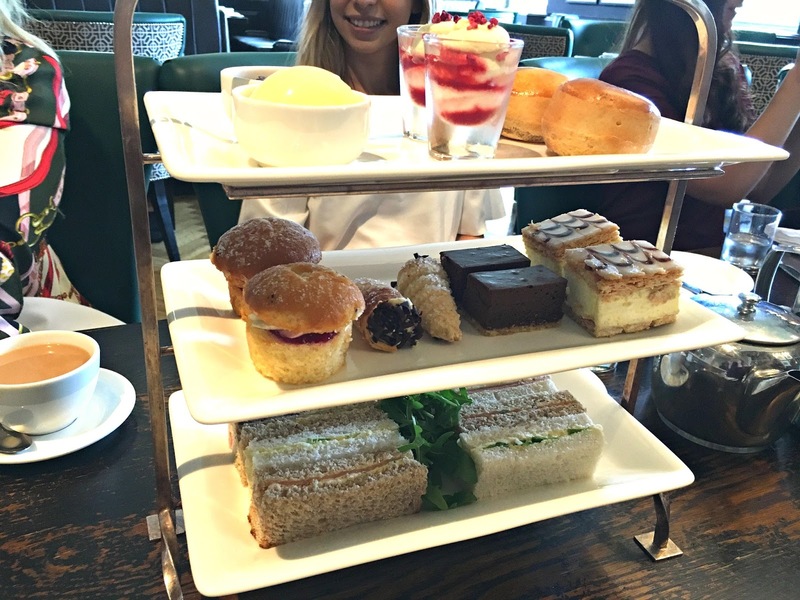 Afternoon tea and a spa visit?! Yes please. The event was organised by Spa Seekers and it was held at Mottram Hall based in Cheshire. Living in busy central Manchester now, but growing up in a tiny village in Nottinghamshire, I dearly missed the countryside and I missed the tranquillity that comes with it. I love Manchester, but there's something about being submerged with quiet and greenery that completely relaxes you. Which is why Mottram Hall is perfectly situated for a Spa and Hotel. The first thing you notice when arriving at Mottram Hall is the beautiful grounds and scenery. With a long driveway and golf courses either side, you eventually see this grand looking building peer through the trees. And it is a sight! Whether you are coming for a round of golf, a relaxing spa weekend, afternoon tea or even to get married, it's easy to see why Mottram Hall is a popular choice. We were greeted with Bucks Fizz and taken into a room for the first part of our day; Colour Matching. I'll be frank with you, I presumed straight away the workshop was going to be about matching your foundation to your skin tone, however, I was quickly informed otherwise and rather, we would be learning in terms of clothing, what colours suit you best. With Colour Me Beautiful, we had a short consultation that gave us an understanding of what colours suited us best, why certain shades compliment our natural colouring more than others and how to introduce new shades into our wardrobe to become more versatile. When it comes to colours, I'm a black and white kinda girl. You won't find many colours in my wardrobe. However, this workshop definitely gave me an insight into other colours that I could be wearing, even darker colours which could help me throw away my 'black and white' safety blanket. I was established as a 'clear dominant' due to my dark hair and blue eyes. We were given samples to see what colours would suit us best, as I was a 'clear dominant', my colours are shown below. Overall, the colour match workshop was incredibly insightful and I'll definitely be taking my colours into consideration when I'm next going on a shopping spree! After the workshop, it was time for the Afternoon Tea! The organisers very kindly prepared some veggie options for me, which consisted of egg and cress and cheese and pickle. I've had a couple of afternoon tea's before, but this one was one of the best, with finger sandwiches, scones and delicate cakes. Everything was delicious. After lunch, it was time for a makeup masterclass! The theme of the makeup was 'from day to night'. 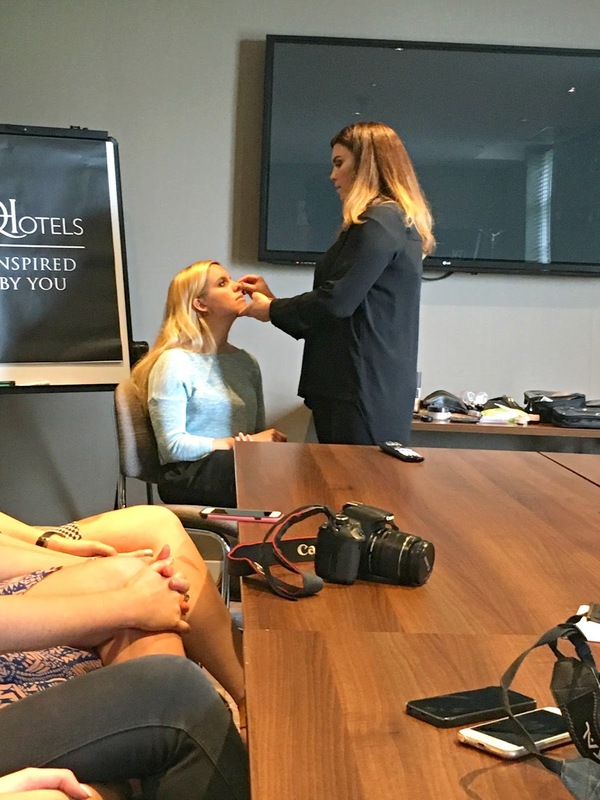 First, the Makeup Artist Chloe showed us how to create a natural, everyday look, then with a few extra products and some false eyelashes, she showed how to take the daytime look to the evening. The next part of our day was a guided tour around the hotel and spa. It was our chance to see more of the beautiful building and grounds as well as what Mottram Hall had to offer. With Mottram Hall being a popular venue for weddings, it was no surprise that a wedding was taking place as we visited. I couldn't help but take a few pictures of the beautifully decorated hallways in preparation for the couple's big day! Our final stop on the tour was the spa and it was also the place I spent the remaining of the afternoon. There's no other way to describe the spa except pure elegance and tranquillity. It hosted a large outside area with various comfortable beds and a jacuzzi. As well as Bachelbath and Stonebath - two of the first in the UK warm thermal rooms that gradually increase your body temperature. You also have the chance to cool off with the cold bucket showers, which admittedly I was too cowardly to try out! Inside you have the chance to take a swim in the pool, or alternatively, relax on the beds or jacuzzi. It was such a lovely, relaxing afternoon and a spa I would not hesitate to return to. Spa Seekers are also giving you the chance to experience a relaxing break at Mottram Hall. Enter their competition to win an all-inclusive 2 day, 1-night spa experience! Have you ever visited Mottram Hall before?